1871. LOCKS - Trade Catalogue. Door Locks, Knobs, Padlocks, etc., Illustrated and Described. Mallory, Wheeler & Co., Manufacturers, New Haven Conn. iv, 5-292 pp. Illustrated with 227 chromolithographic plates. Folio, 455 x 357 mm, bound in contemporary straight-grained brown morocco, blind-ruled fillets, gilt-lettered title on upper cover, by H. M. Robinson, New Haven, CT (with his ticket) . New Haven: Burton Mallory, J. Davenport Wheeler and Frederick B. Mallory, 1871. |~||~||~||~||~| This spectacular catalogue of the locksmith's art is one of the most extraordinary books printed in America in the nineteenth century, and it would certainly be hard to find a more impressive trade catalogue produced on either side of the Atlantic in terms of luxuriousness. The splendid plates in gold, silver and bronze are a triumph of the printer's art. 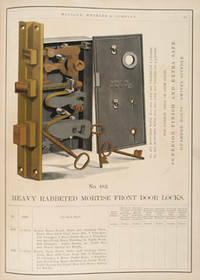 Mallory, Wheeler and Company was established in 1834 and successfully sold locks until just before the First World War. This trade catalogue illustrates their inventory of: Store Door Locks, Front Door Locks, Night Latches, Rabbeted Knob Locks, Sliding Door Locks, Mortise Hotel Locks, French Window Locks and Latches, Mortise Bolts, Upright Rim Knob Locks, Lock and Latch Strikers, Door Keys, Padlocks, etc. The spectacular chromolithographic plates were drawn by A. P. Norman of New York, engraved by Tarbell & Sanford of West Merriden, CT and printed by the Hutchings Printing House of Hartford, CT. Some occasional staining, overall, the condition is excellent, expecially for a book of this size. Some repairs to chipped fore-edges of a few pages, extremities of binding rubbed, volume newly rebacked. Not in Romaine.